Friday, July 20 at 5pm: Family gathering and pot luck dinner. Saturday, July 21: Registration at 9am. Lunch will again be provided at no cost to you by Shelly and her siblings. There will be a silent and live auction, the traditional dessert contest and more. Please contact Shelly with names/number in your party so we will have enough food. This is an election year, so you have an opportunity to place your name or someone else’s on the ballot. All positions are open! Although various branches of the Peter Cauble family met together over the long years since the 1830s in small reunions, the first modern meeting that welcomed all Mary Ann Rotan-Peter Cauble descendants was during the Texas Sesquicentennial (1986-1987) and it was not a reunion. It was a marking of the graves of Mary Ann Rotan (1794 South Carolina-1860 Tyler County, Texas) and Peter Cauble (1786 North Carolina-1870 Tyler County, Texas) to designate their status as Citizens of the Republic of Texas. Julia Cauble Smith H2353 and Gail Loving Barnes H23.10.1 sponsored the event in the Cauble-Burch Cemetery, Tyler County, Texas. The grave markings occurred in April 1986, some time before the restoration of the Historic Peter Cauble House. Several descendants remarked at that time about the need to preserve our historic ancestral home. However, it was many months before the actual project to save the house began. A second meeting of Cauble descendants was held in February 1987 when another grave marking ceremony was held in Hill County, Texas. The first reunion of the descendants of Mary Ann Rotan and Peter Cauble was held on 27-28 May 1988 at Biggs Ranch near Crawford, McLennan County, Texas. Hosts for the meeting were Georgia Morris and Wendel O. Montgomery E1.14.2 along with Ruth Noland and Woodrow W. Biggs E195. Julia Cauble Smith H2353, with the help of Dee Cauble Bitner H1224, registered attendees, made name tags, collected genealogies, and led outdoor games for children and some adults. Attendees paid $15 each for their meals. Wendel and Georgia supplied bakery items, various miscellaneous necessities, and much labor. Julia supplied invitations, postage, name tags, scrapbook, and awards given to the hosts, game winners, and various other attendees. Woodrow supplied labor, the site, and a paid worker; Ruth never left the kitchen. Most adults sat on the large screened porch and visited. The weather was Hill-Country hot. For a wonderful collection of reunion photos, see our blog post “Do you FlickR?” Thanks to Connie and Jim Wallner for posting and describing all of these photos. At the business meeting on Saturday afternoon, Dee Cauble Bitner was elected president of Texas Cauble Family Association. Carole Cauble Fox E1.13.11 agreed to act as secretary and Marguerite Lewis Mosser D637 became treasurer [although the organization had no money; the organization at that time depended upon contributions from Julia, Wendel, Hazel Montgomery E1.14.1, James Sterling Cauble E7223, Mildred Cauble Callihan E1.13.3, and others]. Julia explained the need for the restoration of the Peter Cauble House in Tyler County and encouraged descendants to send pleas to Temple-Inland Foundation, owner of the property. Seventy-five people attended the three-day reunion. The Cauble family met next on 26-28 May 1989 and again at Biggs Ranch in McLennan County. The Montgomerys and the Biggses again served as hosts. Funding and labor for the second reunion came from the same sources as listed above for the first reunion. Again, there were outdoor games for children and some adults. Genealogical information was exchanged. The food was good and the weather was hot. At the business meeting on Saturday afternoon, Woodrow W. Biggs was elected president. Marguerite agreed to continue as treasurer and to assume the role of secretary because Carole needed to resign. Sixty-three people attended. After the business meeting, many Caubles drove to Bell Cemetery near Aquilla, Hill County, Texas, to place a Citizen of the Republic marker and a wreath at the grave of James Lafayette Cauble E1 (25 March 1843 Tyler County, Texas-14 December 1937 Hill County, Texas). On 13-15 July 1990, Texas Cauble family met for its third reunion at Lake Brownwood in Brown County, Texas. Julia assigned each descendant a unique number to denote his or her lineage. Albert Wickizer E5123 videotaped family groups. Fifty-five people attended. At the business meeting on Sunday morning, James Sterling Cauble E7223 was elected president and Marguerite Lewis Mosser was re-elected treasurer [although we still had no money and depended upon voluntary donations to fund postage, newsletters, invitations, and all else]. Julia announced plans to publish a quarterly newsletter of genealogical findings and of descendant news that she would fund and send without charge to individuals and to genealogical libraries until time that the family organization had money to fund it. Julia reported that the contributions and letter-writing campaign undertaken by descendants had initiated plans to restore the Historic Peter Cauble House. Although rain began falling hard early Sunday morning, descendants stayed for a short sermon delivered by Donald Williams Cauble E1.12.6. An exhibit of folk art from Zimbabwe, where Don and Falby had recently served as missionaries, was displayed. After a quick lunch in which all were busied with attempts to remain dry under a roof of many pouring leaks, the Caubles quickly made their separate getaways. The fourth reunion was held at Camp Ta-Ku-La, Peach Tree Village in Tyler County, on 19-21 July 1991. After Saturday lunch, descendants toured the restored Peter Cauble House and grounds. A group picture was taken on the porch and all Caubles moved across the clearing to Cauble-Burch Cemetery where Woodrow had kindly supplied the labor to set in concrete Citizen of the Republic markers at the graves of Helen Elmira Cauble (15 August 1819 Franklin County, Alabama-03 April 1889 Tyler County, Texas) and Valentine Ignatius Burch (14 February 1813 Bullit County, Kentucky-17 October 1892 Polk County, Texas). At the business meeting on Saturday afternoon, James Sterling Cauble was re-elected president and Gary W. Cauble H2421 became treasurer [still we had no money and depended upon voluntary contributions to fund all expenses]. Dee Cauble Bitner agreed to take responsibility for the family registry, relieving Julia of the project she had begun two years earlier. Jane Garrett Levy E1361 agreed to officially keep the scrapbook which she started at the second reunion. Julia remained as editor [and source of funding] of the newsletter. Thirty-nine people registered at the meeting. The fifth reunion was also held at Peach Tree Village on 17-19 July 1992, with thirty-three people in attendance. Roy Lee Hughes C14232 was elected president; Rex C. Cauble E1221 became vice president; Millie McDonald Milson H1231 was named secretary. Wanda Cauble Byler H1221 took the office of the treasurer [although we had no money and depended upon voluntary contributions for all funding]. The registrar, scrapbook chairman, and editor were re-elected. The new president announced plans to raise money to repair the roof of the Peter Cauble House, to maintain cemeteries, and to cover postage and printing costs of the newsletters. Kiefer C. Cauble H2361 invited the Cauble family to Fisher County for the 1993 reunion. The sixth gathering was on 30-31 July and 01 August 1993, at Cottonwood Creek, Fisher County, with Kiefer and Aubry Nell Cauble as hosts. A highly successful crafts auction raised money for family projects. For the first time, the Caubles had a treasury! Bylaws for the association were approved at the business meeting. More than 100 people attended the three-day event. The seventh reunion met 15-17 July 1994, again at Cottonwood Creek, Fisher County. Another successful auction was held. Since it was an even year, the bylaws called for the election of new officers. James Carroll Cauble E1432 was named president; Kiefer C. Cauble H2361 became vice president. Don Cauble E1.12.6 was elected chaplain. Dorothy Lewis Warren D638 and Earl Bluhm, Jr., H1272 were elected directors. The offices of secretary, treasurer, registrar, scrapbook chairman, and editor remained the same. However, Wanda became ill and resigned as treasurer early in the fiscal year and no replacement was found for many months. The eighth meeting was on 23-25 June 1995, at Peach Tree Village, Tyler County. Prior to this meeting, James Carroll Cauble resigned as president and the board elected Jane Garrett Lev� as president and Brian Jenkins H23542 agreed to serve as treasurer for a short time. A second meeting-a regional family day-was observed at Cottonwood Creek, Fisher County, on 14-15 July 1995. Each meeting received fair attendance. The ninth reunion was held 08 June 1996, at the Austin home of Fay and Earl Bluhm, Jr. H1272. Officers were elected with few changes. Tommie Eberhart Hughes C6157 became secretary and Fay Bluhm MH1272 was elected treasurer. Stan Burch D4341 and Dan P. Cauble H1321 were elected directors. Other officers remained the same, except for the resignation of Dee Cauble Bitner as registrar. Julia agreed to return to the job and began again with only the materials she had before Dee accepted the office. A fund-raising drawing of donated items was held. Attendees seemed to enjoy this event. A West Texas Family Day was held in the tenth year of the association’s existence and on 18-19 July 1997, at Cottonwood Creek, Fisher County, with forty-one descendants and friends attending. No business meeting was held, but President Jane Lev� announced the proposed publication of the Cauble family history. Aubry Nell and Kiefer Cauble were hosts once more. There was much eating and visiting. The eleventh year of family meetings was 1998. A reunion was held at Oak Cliff County Club, Dallas County, Texas, on 06 June 1998, with Cathy and Stan Burch D4341 as hosts. Wendel O. Montgomery served delicious bakery goods to the appreciative group in the morning. Dan Chick H23531 entertained the children with games and Al H. Smith MH2353 photographed old pictures that were brought for that purpose. A business meeting followed lunch and Dan P. Cauble H1321 was elected president. Stan Burch was elected vice president. Tommie Eberhart Hughes remained as secretary; Fay Bluhm agreed to continue as treasurer until a replacement could be found; Don Cauble continued as chaplain; Jane Lev� was re-elected Scrapbook Chairman; Julia agreed to remain one term longer as registrar and Bulletin editor. New directors elected were Jack M. Woodruff E982 and M. Patricia Leeton D6233. Dan Chick introduced the children, as well as the youngest, oldest, and farthest-traveled attendees. A fund-raising raffle of donated luxury prizes was held after the business meeting. The twelfth Cauble meeting was on 24 July 1999. It was called West Texas Cauble-Rotan Family Day and gathered at First Methodist Church, Roby, Texas, with Kiefer and Aubry Nell Cauble as hosts. A large number of Rotan descendants attended, making it one of the best reunions the Cauble family has had. Fifty-five descendants and friends attended. The reunion name was changed to honor our Rotan cousins. During the business meeting, attendees voted to hold a family day in Fisher County every year whether a reunion is planned at some other location or not. [The bylaws call for an annual meeting.] Al H. Smith photographed family photographs and documents. The thirteenth meeting of Texas Cauble Family Association was held at Rotan, Fisher County, Texas, on 22 July 2000. In honor of our Rotan cousins, it was called the Cauble-Rotan Family Reunion. President Dan P. Cauble chose to have the reunion in Rotan, Texas, a town named for Mary Ann Rotan’s nephew, John Edward Rotan of Waco. Kiefer and Aubry Nell Cauble hosted the meeting at Rotan Community Center. As entertainment for the gathering, attendees sang hymns and the children presented a short singing performance under the leadership of Carolyn Cauble Long H2362. Dan Chick H23531 gave a short, humorous talk about the stock market. In business meeting, new officers were elected. Kiefer C. Cauble was elected president and Dan Cauble agreed to serve as vice president. Tommie Eberhart Hughes remained as secretary and Gwen Stewart Chick MH23531, a CPA, agreed to do our accounting as treasurer. Don W. Cauble continued as chaplain. Jessie Cauble Pendergrass H239 and Trina Beth Reed Johnson, a John A. Rotan descendant, were elected directors. Kiefer agreed to relieve Julia of newsletters for the year so she could complete the family quilt. Julia continued as the registrar. General consensus was that the fourteenth meeting should be held at Peach Tree Village, Tyler County, Texas. In the summer of 2001 two family meetings were held. The first and official reunion met on29-30 June and 01 July 2001 at Peach Tree Village, Tyler County, Texas, near the Historic Peter Cauble House. Camp Ta-Ku-La, the Christian retreat on the grounds of the Kirby home, was the reunion site at Peach Tree Village. Connie Baker Wallner E22221 acted as secretary and registered attendees. Friday evening was devoted to eating the evening meal, viewing scrapbooks, and visiting. President Kiefer Cauble opened the Saturday meeting after breakfast with the telling of family stories. A tour of Camp Ta-Ku-La, its museum, and it church began at 10:15 a. m. After lunch, Jessie Cauble Pendergrass conducted the dessert contest. Door prizes were handed out by Alice Midyett Paramore C43121 and Aubry Nell Cauble MH2361. The family quilt, which was pieced and quilted by Julia Cauble Smith from squares constructed by family members over the last six years, was auctioned for a one-year possession. It was won by Kiefer and Aubry Nell Cauble. At the business meeting, Revis Cauble Leonard H2361 announced plans to construct a scrapbook of tried-and-true family recipes. After the business meeting, attendees toured the Historic Peter Cauble House and made a photograph together on the porch. At 2:50 p. m. homemade memory markers or headstones were dedicated for James W. Cauble [family number I and youngest son of Mary Ann Rotan and Peter Cauble] (1832 Marion County Alabama-31 August 1867 Hardin County, Texas; probably buried Cauble-Burch Cemetery, Peach Tree Village, Tyler County, Texas); for Mary Jane Cauble (28 July 1860 Polk County, Texas-28 August 1864 Polk County, Texas), a daughter of Sarah Ann Butler (1841 Alabama-after June 1880) and James W. Cauble; and, for John A. Rotan (1794 South Caroline-Fall 1858 Tyler County, Texas), a kinsman of our Mary Ann Rotan. Attendees were served supper at Camp Ta-Ku-La, followed by visiting, story-telling, and scrapbook viewing. After breakfast on Sunday, a short worship service was held at the Peach Tree Village church. Attendees felt the meeting was well worth the long drive to meet kin, stand inside our ancestral home, and visit the graves of ancestors. On 28 July 2001, a West Texas Family Day was held at Rotan Community Center, Rotan in Fisher County, Texas. Among those who told family stories were Buster Cauble E1.12.4, Falby Cauble ME1.12.6, Lavonia Cauble Loving H23.10., Kiefer Cauble, and Monell Speer H2312. A second, smaller quilt constructed by Julia was raffled after the covered-dish lunch. It was won by Lois Ann Cauble Colwell H2362. Jessie Cauble Pendergrass was in charge of the dessert contest and Dan Chick awarded door prizes. The Stockman, The Showman, and The Feedsack scrapbooks were displayed. 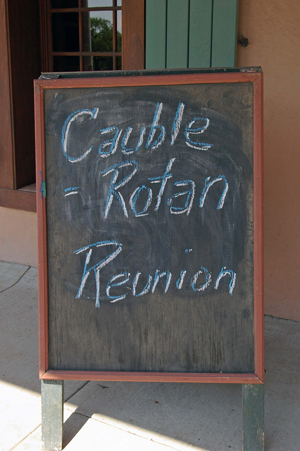 In its fifteen year, the Cauble-Rotan Family Reunion met at Rotan Community Center, Rotan, Texas, on 19 July 2002. Attendees shared Cauble family stories, visited, sang gospel and patriotic songs, ate too much, awarded door and dessert prizes, looked at our many scrapbooks, and permanently auctioned the beautiful Cauble quilt. It was bought by Mildred Cauble Callihan E1.13.3. At the business meeting, the following officers were elected or re-elected for the next two-year term: President Kiefer Cauble H2361; Vice President Dan Chick H23531; Secretary Connie Baker Wallner E22221; Treasurer Gwen Chick MH23531; Chaplain Don Cauble E1.12.6; Scrapbook Chair Jane Levy; Registrar Julia Cauble Smith; Director Jessie Cauble Pendergrass H239; and, Director Trina Beth Johnson RO9. After the 2002 reunion, the board of directors voted to limit to $200 the amount the treasury of Texas Cauble Family Association would provide for any one reunion. All other reunion expenses must be paid by pledges or by registration fees. Also after the reunion, Sylvia Caldwell Rankin C76211 kindly agreed to maintain a web site for our family within her domain. We quickly and gladly accepted the generous offer. On 19 July 2003, the family met again at Rotan Community Center, Rotan, Texas, with descendants from the C14, E1, E2, E7, H1, and H2 Cauble families in attendance. We were honored to have two cousins from the James Hardin family. All H1 and H2 families are also James Hardin descendants. Attendees who had never before attended a reunion were: Gean and Jack Cauble E1512 from Stanton, Texas; Bobi Jo Roberson Davis H1215 from Merced, California, Bill and Tomi Cauble Hudson E255 of Wichita Falls, Texas; Phyllis Hudson Hance E2551 of Wichita Falls, Texas; Dee Shelley HA514 from Lawrence, Kansas; and, Lydia Taylor Maruyama HA544 of Ulysses, Kansas. In their meeting, the board of directors happily voted to send $500 from contributions by family members for the maintenance of the Historic Peter Cauble House and the Cauble-Burch Cemetery at Peach Tree Village in Tyler County, Texas. A new project was begun at this meeting to help our family organization be informed about our fellow descendants. Captains were appointed to check on and report about address changes, births, weddings, prayer needs, military personnel, honors or life achievements, and deaths among our large, extended family. The E7 descendants in attendance agreed to sponsor a reunion in Albany, Texas, in the summer of 2004. Cauble-Rotan Family Reunion met on 18-20 June 2004 at the beautiful and spacious Whitney Theatre, located on the square and across from the courthouse, in Albany, Texas, with well over 100 in attendance. The theme of this reunion was an appreciation of our ranching heritage. In an effort to raise funds to support our family association, tee shirts, aprons, caps, stationery, and frame-worthy prints with the image of the historic Charles Monroe Cauble Home were sold. Chuck-wagon meals were available on the courthouse lawn from Bill Cauble’s Western Wagons. After Friday evening dinner, many attendees were caught in a rainstorm as they attempted to see the Fandangle performance which was finally rained-out. Others spent the evening visiting and viewing scrapbooks at the Whitney. The morning of Juneteenth began with visiting, sharing of old documents and letters from the Charles Monroe Cauble E7 papers, and viewing of our many family scrapbooks. After the noon chuck-wagon meal, President Kiefer Cauble led the family in prayer, remembering especially family members serving in the military. Bob Green, an honorary Cauble who is descended from Green family friends of the E7 Cauble family, spoke about local history to the enjoyment of all present. After lunch, awards were made to Bill Green who became an honorary Cauble, to outgoing president Kiefer Cauble for outstanding service, to Julia Cauble Smith for eighteen years of family work, to dessert contest winners, and to the attendee who traveled the farthest, as well as the oldest and youngest attendees. During a short break in the program for photographing all attendees and after the business meeting, Bill Cauble E7221, famous chuck-wagon cook and author, signed copies of his book for attendees. Signed copies of Bob Green’s book were also available for purchase. Officers for the new term were introduced by Past President Roy Hughes C14232. The following were elected or re-elected: President James Sterling Cauble E7223; Vice President Dan Chick H23531; Secretary Connie Baker Wallner E22221; Treasurer Gwen Chick MH23531; Chaplains Don Cauble E1.12.6 and Kiefer C. Cauble H2361; Scrapbook Chair Revis Cauble Leonard H23611; Webmaster Sylvia Caldwell Rankin C76211; Registrar and acting editor Julia Cauble Smith H2353; Director Jessie Cauble Pendergrass H239; and, Director Mildred Cauble Callihan E1.13.3. Following the business meeting, descendants toured the restored home of Juriah Virginia Vines and Charles Monroe Cauble E7, who were prominent ranchers in Shackelford County in the late 19th and early 20th centuries. The tour also continued through Albany Cemetery, where many Cauble descendants are buried.